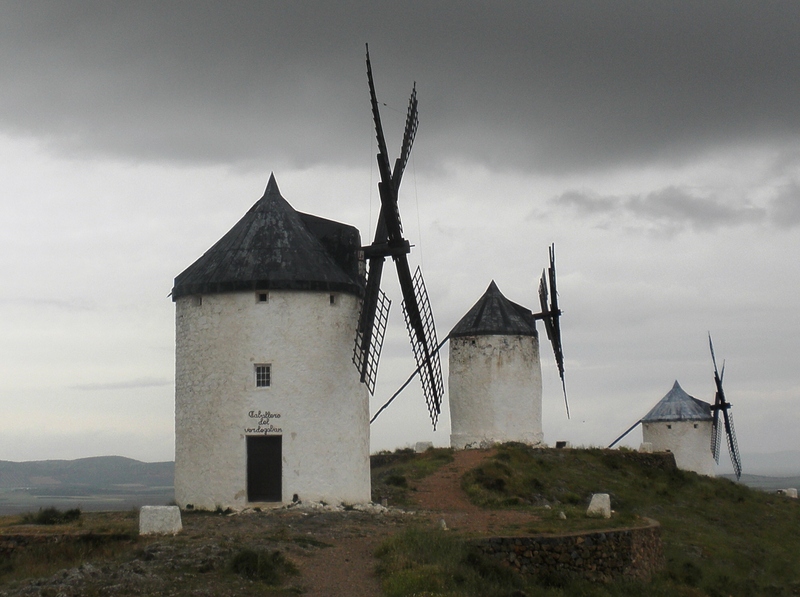 From Belmonte to Cuenca was a distance of about sixty miles and leaving Belmonte the drive took us first of all through gently undulating fields with the most attractive colours that rolled rhythmically but desolately away in all directions. A stunning vista of subtle hues and variations of tone; champagne and parchment, butter-milk cream, dusty olive, lavender grey, pheasant copper and russet gold that were almost autumnal all lying lifeless and crushed under the burden of a vivid blue spring sky. 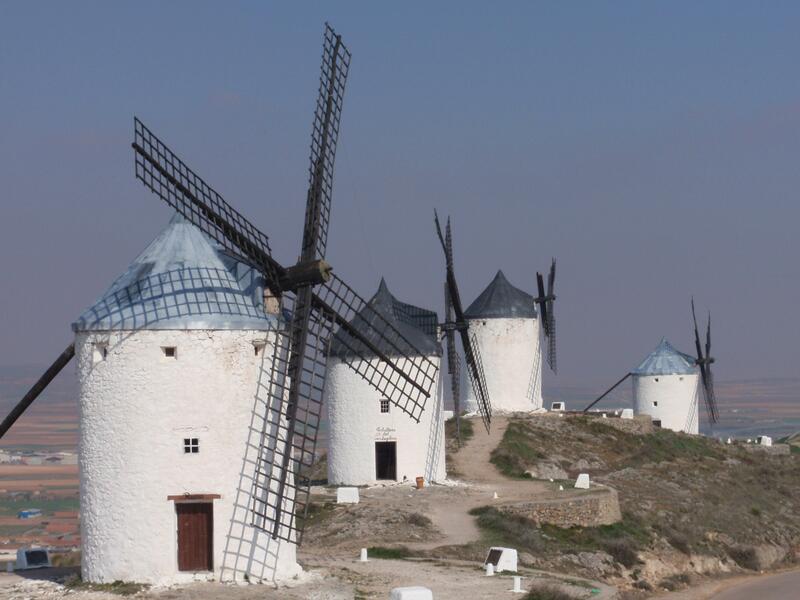 Now we were on the ‘Ruta de Don Quixote’ which is the golden thread that binds the Castilian tourist industry together in a ribbon of castles and windmills stretching all the way in a circuitous route from Madrid to Toledo. We were using a relatively minor road and after half way the landscape began to change and we left behind the patchwork of fields and farmland and as we started to climb through hills there was more drama with steep sided hills and pine forests and the busy water of the Júcar River dashing madly through narrow gorges. 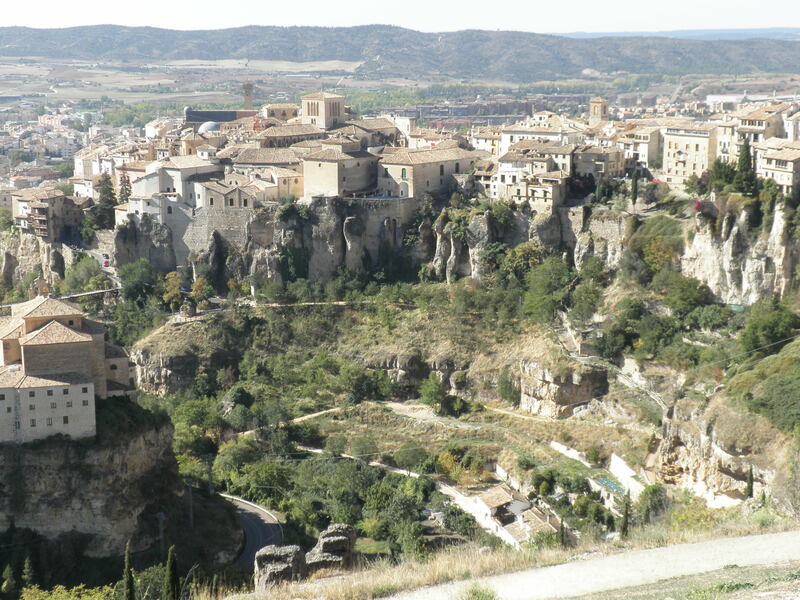 We were approaching the city of Cuenca. Cuenca is a big city and capital of the fifth largest province in Spain but we found a parking spot next to the river with surprising ease. 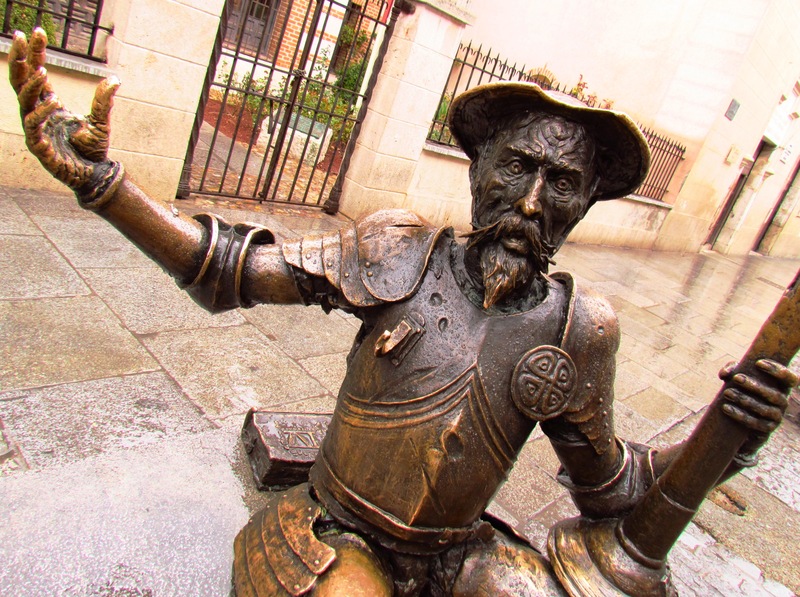 The city was built here because the rocky outcrop of land lies between two deep river gorges, the Júcar and the Huécar and it made an excellent location for a defendable fortress. At three hundred miles long the Júcar is a big river but it was not especially lively today in the City and we followed a man in a battered sombrero along the path next to the lethargic oozy green water that slipped lazily by until we came to steep steps that took us away from the water and up towards the old city, through a crumbling arch and into the main street to the top. On the way we passed some brightly coloured tall buildings just before a narrow archway in the road underneath the town hall that led into the Plaza Mayor. In the Plaza there were more gaily coloured houses, shops and pavement cafés and bars and the city’s Cathedral that was completed in the thirteenth century but partly fell down in 1902 and over a hundred years later the rebuilding of the façade still remains to be fully completed and remains a curious mix of architectural styles from Anglo-Norman to Iberian Gothic. We continued to the top stopping on the way to climb the castle walls and to admire the scenery of the gorges stretching out seemingly endlessly on either side of the city. Climbing even further we reached the very top and here there were various vantage points of the city from elevated craggy rocks where people, without the precaution of a parachute were walking out and taking as much risk as they might dare just to get the perfect selfie photograph. Standing above the vast ravine that winds its way around Cuenca I could suddenly see why this was once regarded as the unconquerable city. This ancient citadel is perched on a steep rocky peak, high above the surrounding plain, and the treacherous gorge below encircles the city like a moat and this is the deepest moat you’ve ever seen, a giddy drop of several hundred feet, with nothing beneath to break a fall. From this position it was clear to see how the city had developed. There was only limited space at the top of the rock so as it grew and it was unable to expand outwards the city went up instead and that explained the tall houses. 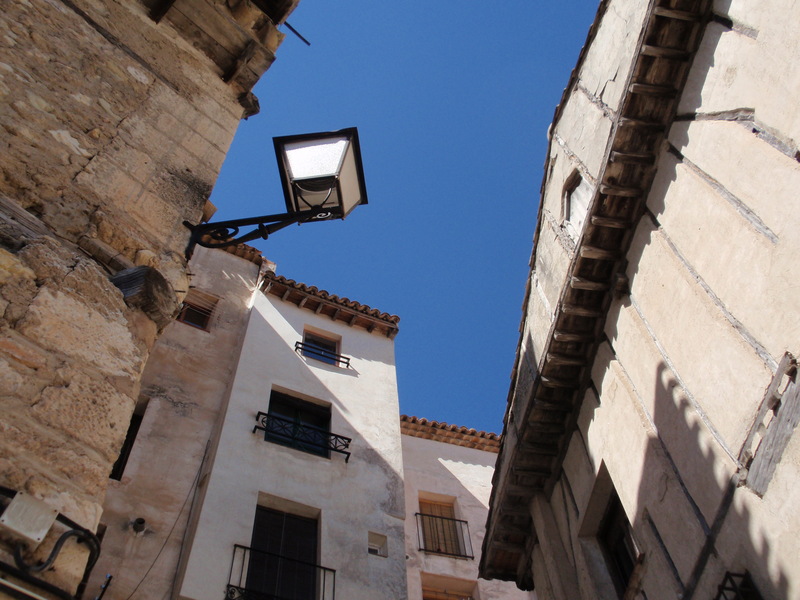 Even more dramatically it also went as far as it possibly could in making use of all available space and in the fifteenth century houses were built like Swallow’s nests with rooms and balconies partly and precariously overhanging the gorge above the Huécar River. 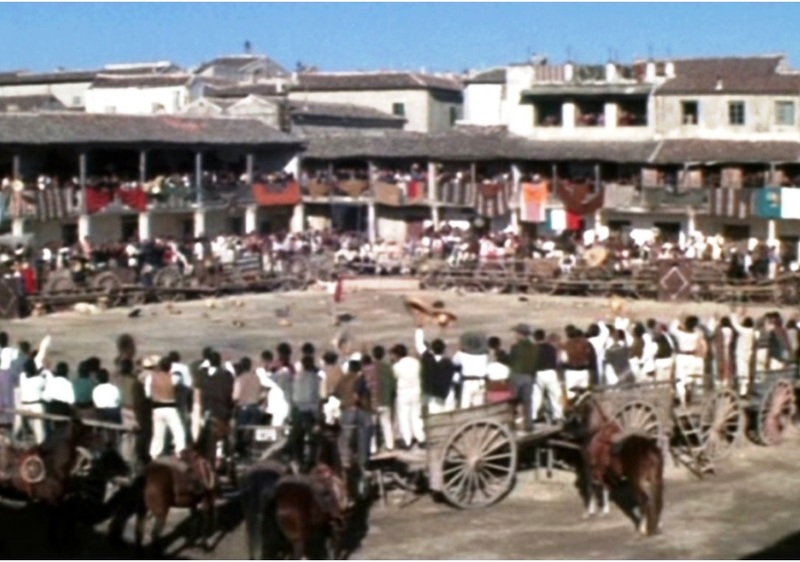 These are called the Las Casas Colgadas, the hanging houses, and are the most famous attraction in the city. 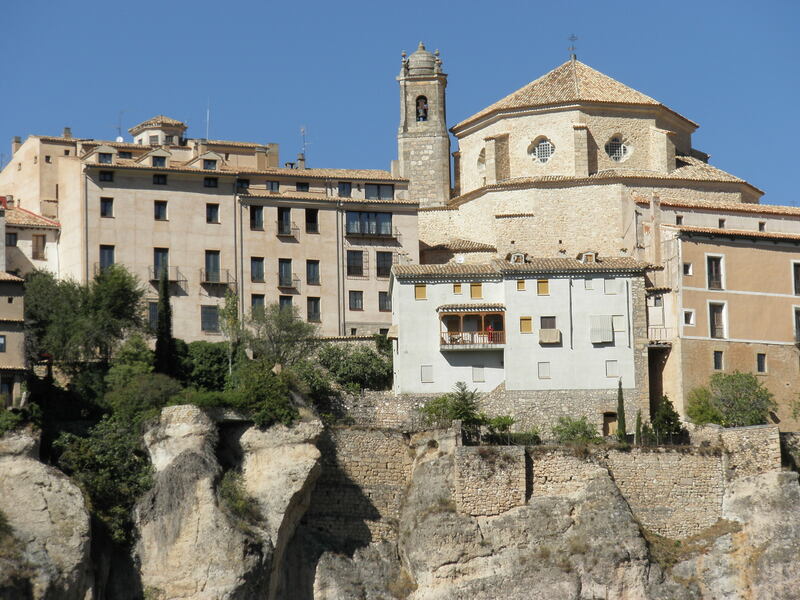 It was time for lunch but at half past three the bars and restaurants were all overcrowded and doing brisk business and with no prospect of a seat there we had to walk back towards the town and discovered a place in full sun overlooking a rather splendid convent. I was surprised that the town was so full but we learned later that today was Father’s day in Spain and all of the children were off school and out with their parents for the day. We decided to have some tapas but the menu was giving nothing away in assisting with a selection of dishes we didn’t recognise and the waitress could give no helpful explanation except in Spanish so we went for the ‘surprise me option’ and stabbed a nervous finger towards a couple of items on the menu and sat back in anticipation. When it arrived we had a chicken dish and a sort of mutton stew, which we probably wouldn’t have knowingly selected but it was tasty and filling and we ate it all and when we had finished we communicated to the waitress the best that we could that we had thoroughly enjoyed it in that polite sort of way that we do when we cannot speak each other’s language. It was late afternoon so we left Cuenca getting slightly lost in the tangle of streets on the way out and with no real alternative returned to Belmonte by the same route, first through the rugged hills, the raging water and the winding road and then to the gentle rolling plains, the languid fields and the long straight road. Later we walked out again and even though this was Father’s day Belmonte was just as quiet as the night before but we found a nice bar in a hotel in the centre of town where we had drinks and olives before returning to the Palacio Buenavista Hospedestra for evening meal, a last drink in the bar and a second early night. It had been a very good day indeed! 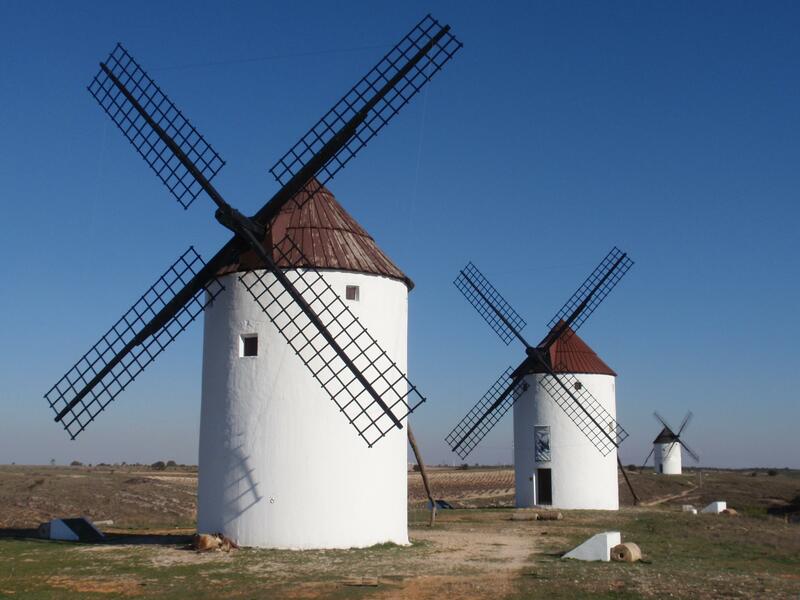 Some time ago now we set ourselves the ambitious task of visiting all of the seventeen Autonomous Communities of Spain and to begin our quest we chose Castilla-La Mancha, the land of Don Quixote, windmills and wide open plains. It was an early morning .flight and in razor sharp skies the plane crossed the Atlantic Spanish coast somewhere close to the city of Santander and below us we recognised the two thousand five hundred metre high peaks of the Picos de Europa and then crossed the massive northern mountainous regions of northern Spain. It was brown and rocky with huge mysterious pine forests and blue shimmering lakes, long roads negotiating the mountains and valleys and snaking between towns and villages and from above it was possible to begin to appreciate the immense size of the country and of the task that we had set ourselves. Closer to Madrid the predominant browns gave way to vibrant greens and then into a mosaic of contrasting colour as the aircraft made its final descent and landed at the airport. It was rather disorganised but the customs were brilliant and the United Kingdom immigrations control could learn a thing or two about getting passengers through an airport quickly from these guys. 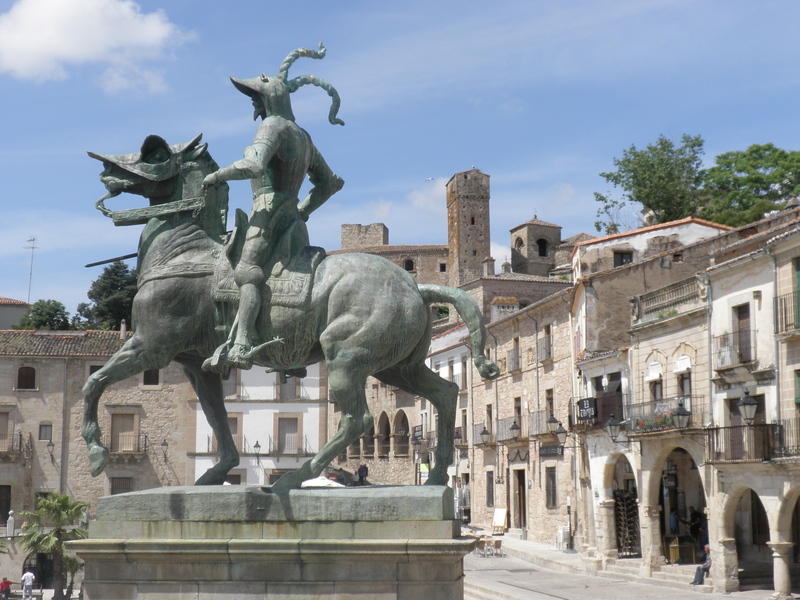 Then collecting the car was gloriously simple as well and within forty minutes we were heading out of the city on the A3 motorway and on our way towards our first destination, the town of Chinchón, about thirty miles south of Madrid. 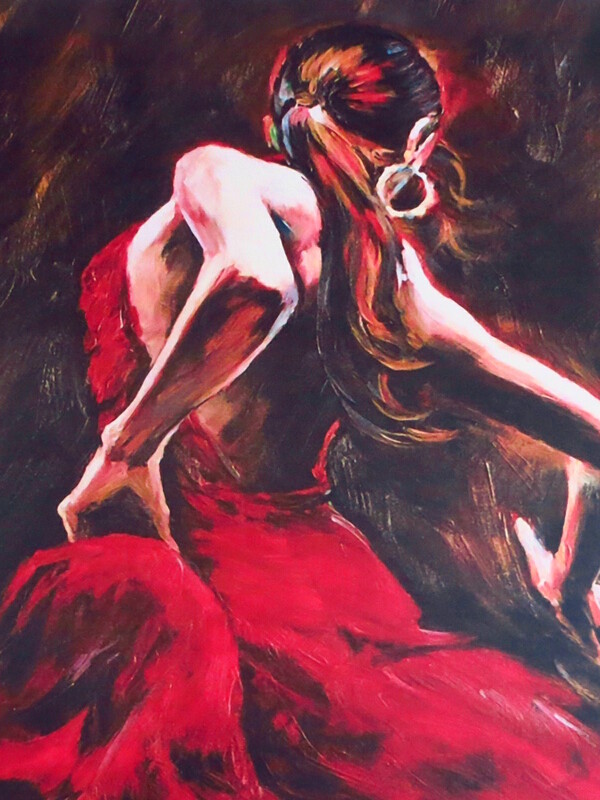 Not far out of the city the scenery suddenly became more attractive with acres of olive trees and stumpy black vines slumbering in the fields each with the contorted face of a medieval gargoyle concealed within its gnarled and knotted trunk. In the trees and on top of pylons there were stork nests and in the sky buzzards hung above us on the thermals looking for easy lunch in the fields below. 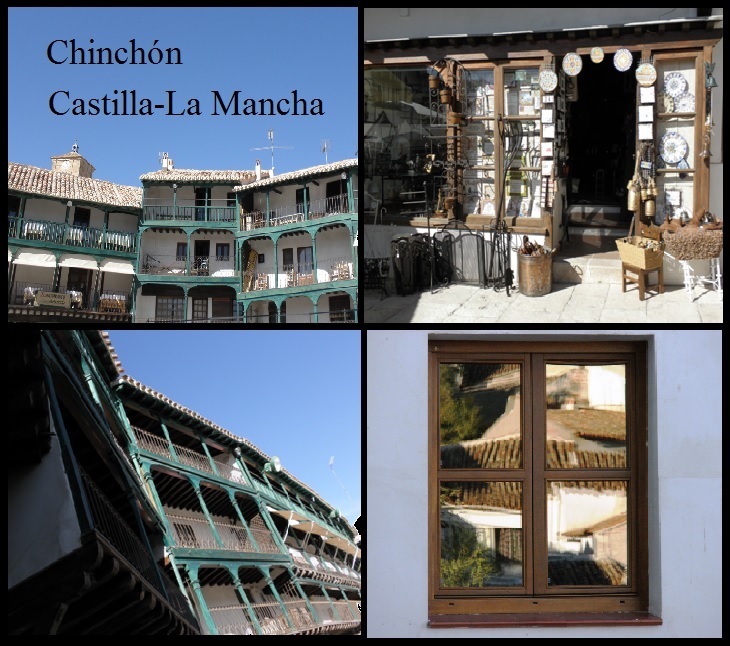 We arrived in Chinchón at about half past one and ignoring the edge of town tourist car parks steered the car towards the Plaza Mayor at the very centre of the town. Parking has rarely been easier and there was a perfect spot right in the Plaza and I was sure there must surely be a catch. There was a glorious blue sky and big sun and it was warm enough to change into summer holiday linens although this did take some of the locals by surprise as they were wrapped up in woollies and coats and still obviously uncertain about and distrustful of the early Spring weather. 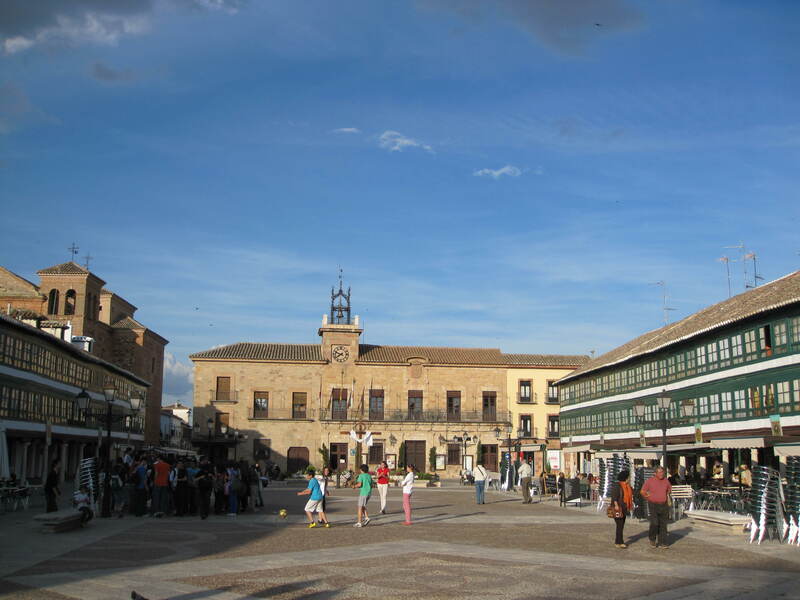 The Plaza is in a marvellous location with a big irregular shaped square that is used for town festivals and the occasional bullfight; it is surrounded by a hierarchical arrangement of buildings of two and three storeys with two hundred and thirty-four wooden running balconies, called ‘claros’ and shops, bars and restaurants on the ground floor all spilling out onto the pavement. After a few minutes spent soaking up the atmosphere we compared menu prices in the bars and selected the cheapest tables on the sunny side of the square and settled down for lunch where we enjoyed salad, calamari and tortilla and after a couple of glasses of Spanish beer set off to explore some of the tiny streets running like a spiders web off of the square. First through narrow lanes of whitewashed houses to the very top of the town and to a castle with excellent views over the houses and the surrounding villages and countryside but the castle was in a state of serious disrepair and closed to the public so we left and after calling in at the Parador hotel to see how wealthy people spend their holidays we walked to the other side of town and climbed again, this time to the church which had equally good views over the tiled roofs of the houses which in some way reminded me, in an ochre sort of way, of Tuscany. Beyond the houses there were the surrounding villages and the predominantly buff and grey coloured countryside stretching as far as the horizon. 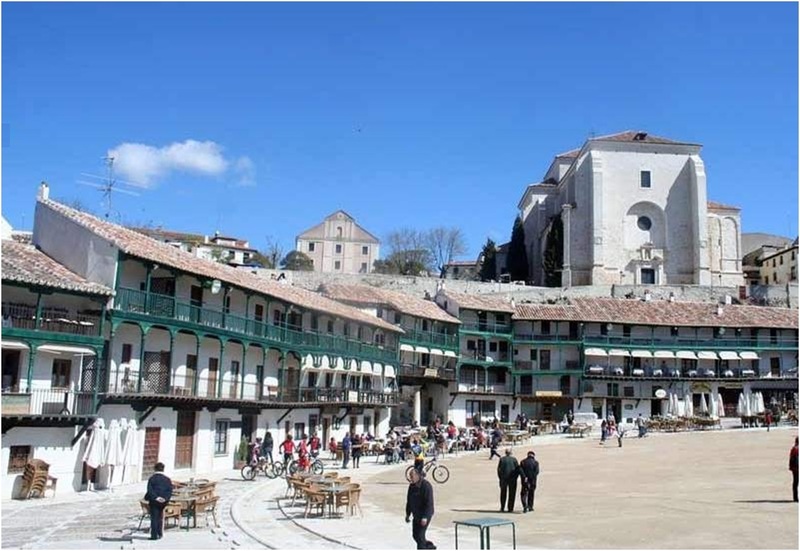 From this elevated position it was possible to appreciate that despite its close proximity to Madrid that Chinchón is essentially a small Spanish village and despite the Plaza, which grabs all the attention this is a living and working community. From the castle we took the road back into town which took us through lazy whitewashed streets where elderly ladies in black dresses sat gossiping in the doorways and men folk sat on benches discussing important matters of the day. In the centre of town along streets leading off the Plaza there were a few shops, a mini market, butcher, grocer and a fishmonger, an electrical shop that didn’t look as if it had sold anything for a very long time, a florist and a photographer. And we were back at the car park; we liked this place and wished that we were stopping longer but it was time to leave now and make our way to our accommodation in the provincial town of Belmonte. We drove directly to the very top of the old city and parked the car at a scenic point where there was the most stunningly magnificent vista stretching out below us. 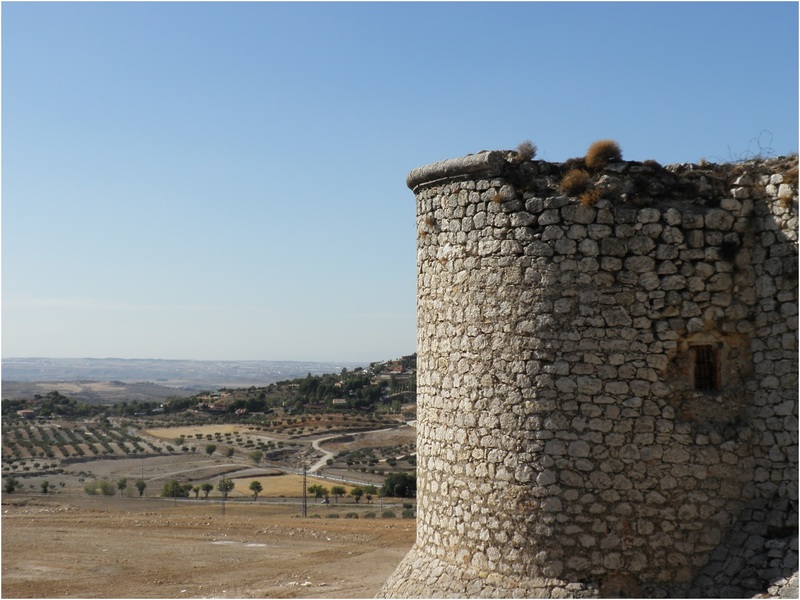 The city was built here because the rocky outcrop of land lies between two deep river gorges, the Júcar and the Huécar and it made an excellent location for a defensive fortress. Walking down from the car park towards the main Plaza where there were gaily coloured houses, shops and pavement cafés and bars and the city Cathedral that was completed in the thirteenth century but partly fell down in 1902 but over a hundred years later the rebuilding of the façade still remains to be fully completed and remains a curious juxtaposition of architectural styles, from Anglo-Norman to Iberian Gothic. That is the way that they do things in Spain. Mañana. Tomorrow will do. Kim always says that I should have been born Spanish! 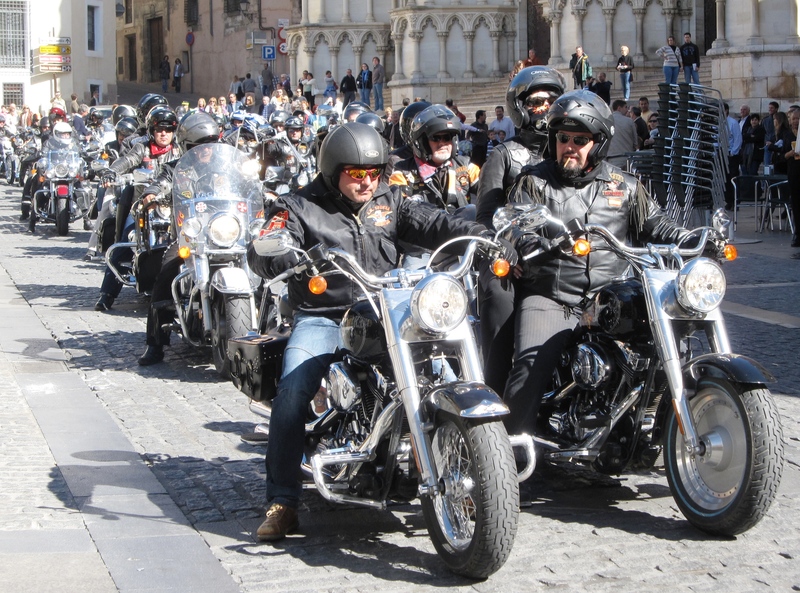 It was time for refreshment so we stopped at a café with tables in the sun and watched a bizarre gathering of what must have been nearly a hundred bike enthusiasts all of whom looked as though they had stepped off of the set of Easy Rider, all cracked leather and faded denim. The police weren’t very welcoming and more and more of them arrived to keep an eye on things. They didn’t seem to doing any harm but eventually someone important told them to move on and they fired up their satanic black and gleaming chrome machines and clutching their cow horn handlebars left the Plaza with much revving of engines in an attempt to make as much noise as they possibly could. The police kept straight faces but all of the people at the pavement tables thought it was very entertaining and clapped and cheered enthusiastically. After this the Plaza settled back into a lazy Saturday afternoon and we moved on to see the rest of the city. Following the route towards the edge of the gorge it was plain to see how the city had developed. There was only limited space at the top of the rock so as it grew and it was unable to expand outwards the city went up instead and that explained the tall houses. 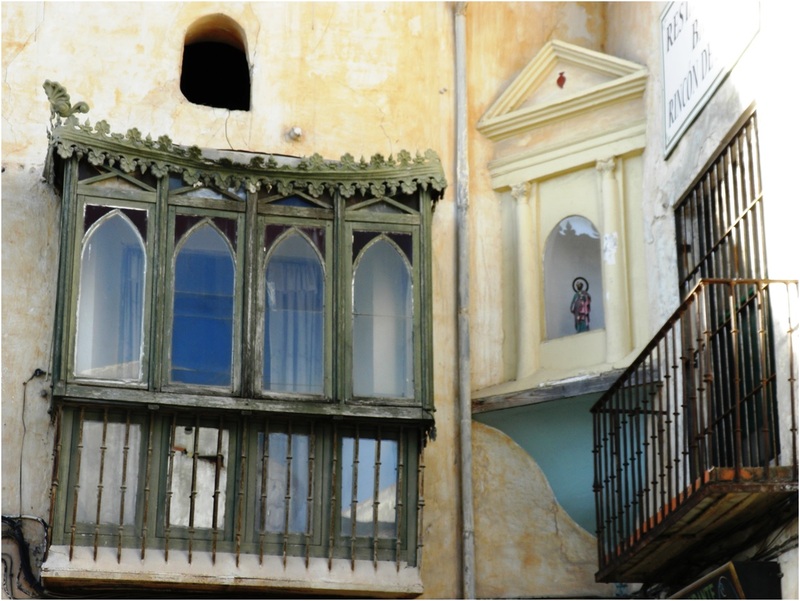 Even more dramatically it also went as far as it possibly could in making use of all available space and in the fifteenth century houses were built like Swallows’ nests with rooms and balconies precariously overhanging the gorge above the Huécar River. 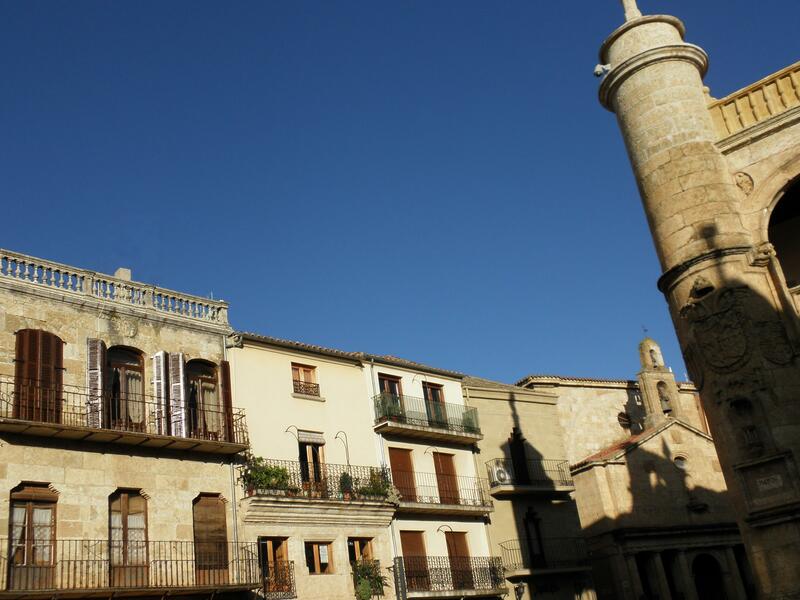 These are called the Las Casas Colgadas, the hanging houses, and are the most famous attraction in the city. It was time for lunch so we returned to the top of the city stopping on the way to climb the castle walls and to admire the scenery of the gorges stretching out on either side of the city. Climbing even further we reached the top and there were vantage points of the city from elevated craggy rocks where people were walking out and taking as much risk as they dare just to get the perfect photograph. Our first choice of restaurant had no available tables and as people seemed as settled in as barnacles clinging to a rock the prospects didn’t look good for some time to come so we found a second choice with a table in the sun and on account of the high prices declined a full dining experience and settled for overpriced toasted bread with tiny toppings instead. To be fair it was in an excellent location and something like 75% of the menu price was just for the magnificent view. Cuenca is famous for birds of prey and overhead there were large raptors that were riding the thermals and just like us were looking for lunch. Some of them were buzzards, which are quite common in Northern Spain but later we saw something different that we later identified as the magnificent Spanish Imperial Eagle and we considered it a privilege to have seen them. 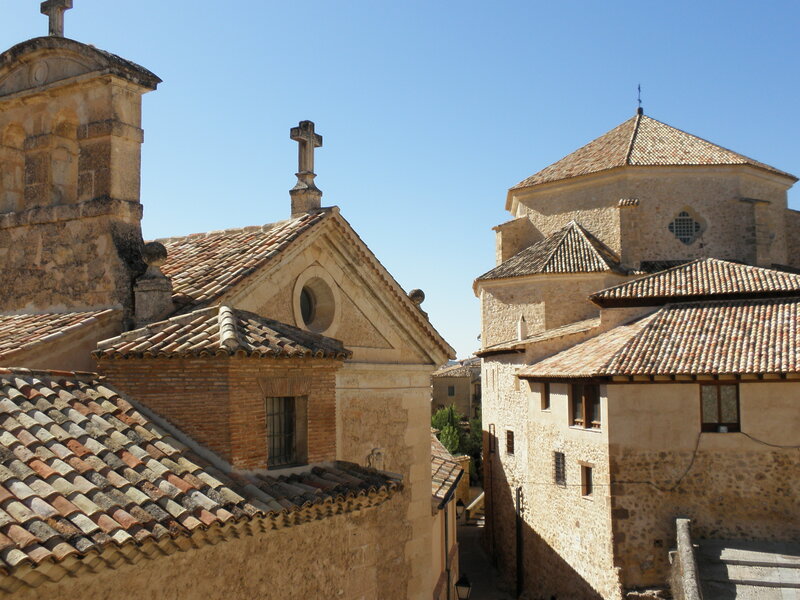 It was late afternoon so we left Cuenca getting slightly lost in the tangle of streets on the way out and with no real alternative returned to Chinchón by the same route, first through the rugged hills and the winding road and then to the gentle rolling plains and the long straight road. We drove on wide empty roads, so empty in places that we wondered from time to time if we had missed a ‘road closed‘ sign. Eventually we arrived at the industrial town of Tarancón, which was not a place to hang around so we drove swiftly through and then followed a more direct route than we had taken this morning directly back to Chinchón where preparations for tomorrow’s bullfight were stepping up and there were a number of road closures that made it somewhat difficult to get back to the hotel and then some parking restrictions that meant having to pay to use the underground car park. We purchased some beer and wine from the little shop that was open again this evening and then those of us that had a balcony enjoyed an hour in the sun with a glass of wine and those of us that didn’t stayed in their rooms. Later we returned to the same restaurant/bar as the previous evening and, because Sue and Christine had declared the menu acceptable, we had mostly the same food again as well. We were staying at the Hotel Retiro del Maestre, a renovated old Spanish nobleman’s house on a dusty street leading to the main square of Almagro. It was a friendly family run hotel with spacious and comfortable public rooms, a large outside terrace basking in the pleasant sun and was a nice room for us with a view over the garden. 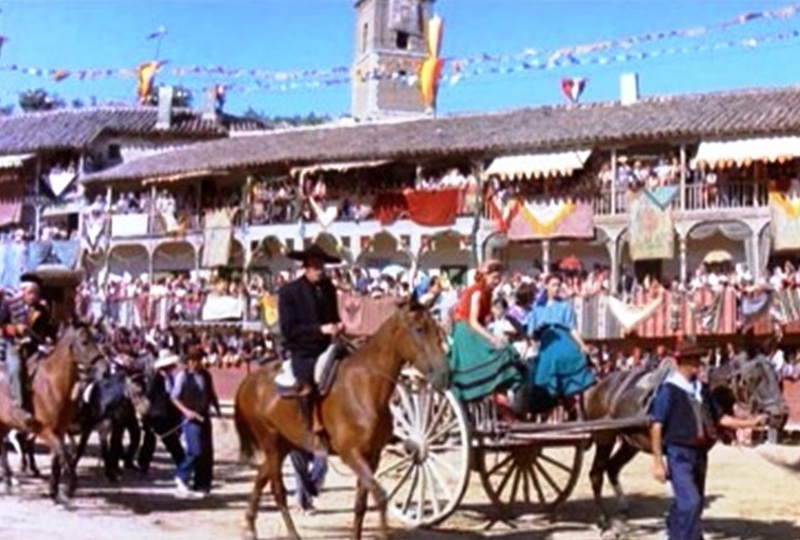 At a hundred metres long and forty metres wide it is flanked on both sides by arcades of cream Tuscan columns, weathered by the years, supporting overhead galleries all painted a uniform shade of botella verde and fully glazed in a central European style that makes this place truly unique in all of Spain. 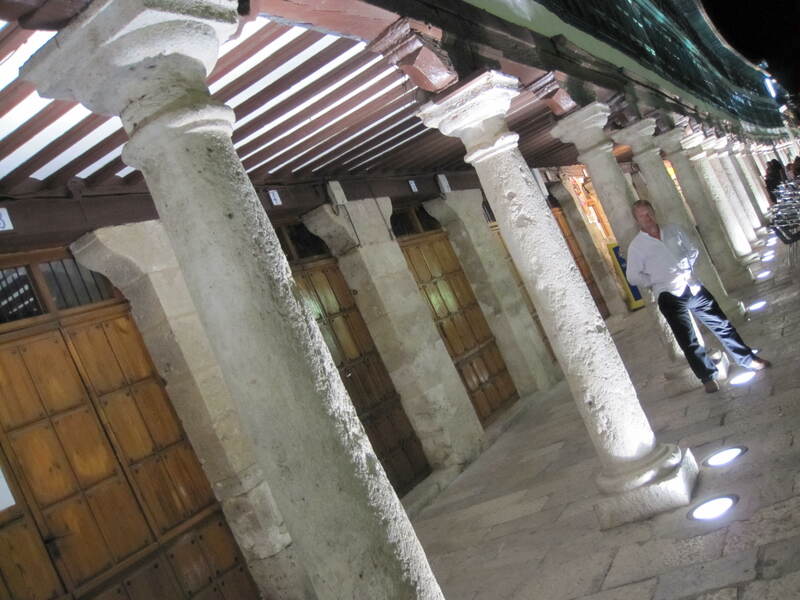 These galleries were originally open and used as grandstands for public events, religious festivals and even bullfights that were held here until 1785, when they were finally banned by King Carlos III. We choose a table on the sunny side of the Plaza, ordered beer and wine and just sat and watched the activity while we nibbled the inevitable olives. The bar owner shooed away some small boys playing football, telling them to play elsewhere as families began to arrive and the bar quickly filled up with chattering customers enjoying the late afternoon sunshine. 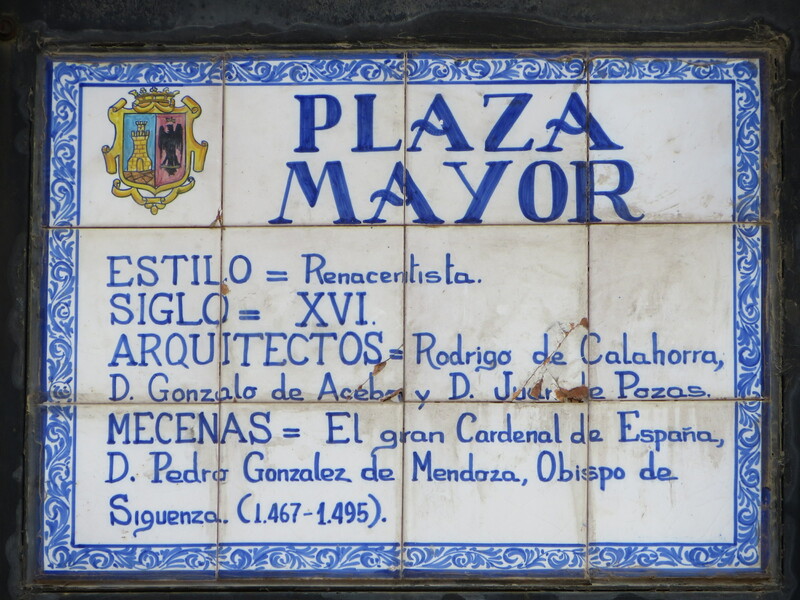 The Plaza Mayor is the most important part of a Spanish town or city and I really cannot think of an equivalent in the United Kingdom where we have public squares but use them in an entirely different way. This is the place where people meet, relax and enjoy themselves; it is generally flanked with shops and restaurants and usually has the town hall and the main church somewhere close by. In the centre sits a military veteran with only one arm selling Spanish lottery tickets. 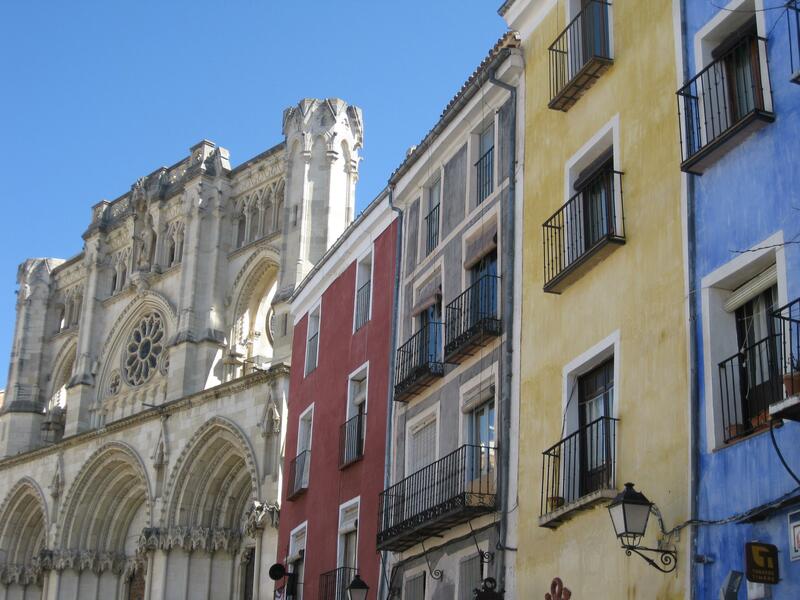 When we arrive somewhere new it is usually the first place we make for because sitting with a glass of wine and a complimentary tapas it is the best place to be to get a feeling for the character of the town and its people. 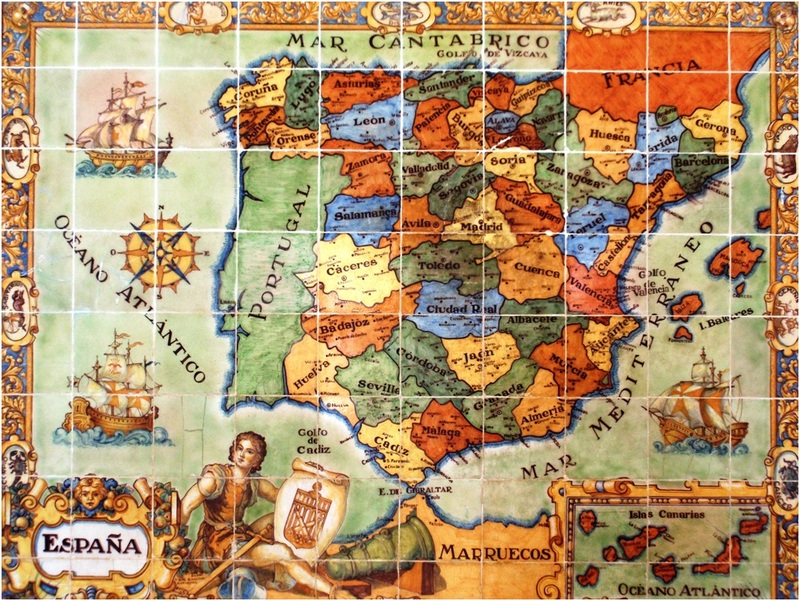 In the search for real Spain we have visited and enjoyed dozens of Plaza Mayors; Madrid, the largest, Salamanca, the second largest, Toledo, next to its towering cathedral and the tiled Plaza de España in Seville. We liked them all and we began now to compile a list with a view to choosing our top five favourites. After a second leisurely drink we paid up and left the square and strolled back to our hotel where we asked for some dining recommendations and the receptionist convinced us to go to her favourite restaurant just a couple of streets away so after we had rested and changed we took her advice and found the place in a side street off the main square. 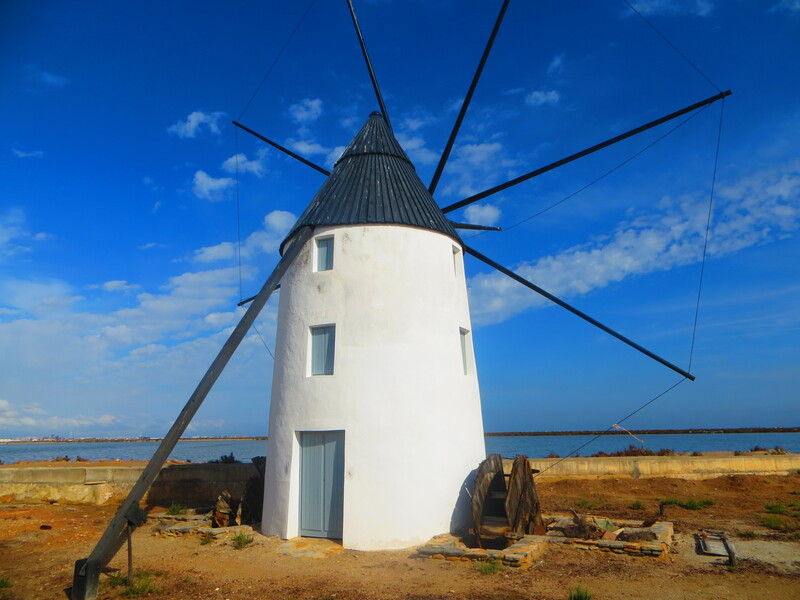 Although it wasn’t especially late when we finished the meal we were tired after a long day that had started three hundred kilometres away in Mérida, taken us to Trujillo and then a three hour drive to Almagro and we were ready for bed. We walked back through the Plaza Mayor that was lively in a subdued sort of way (if that makes sense) and then to the street to the hotel. 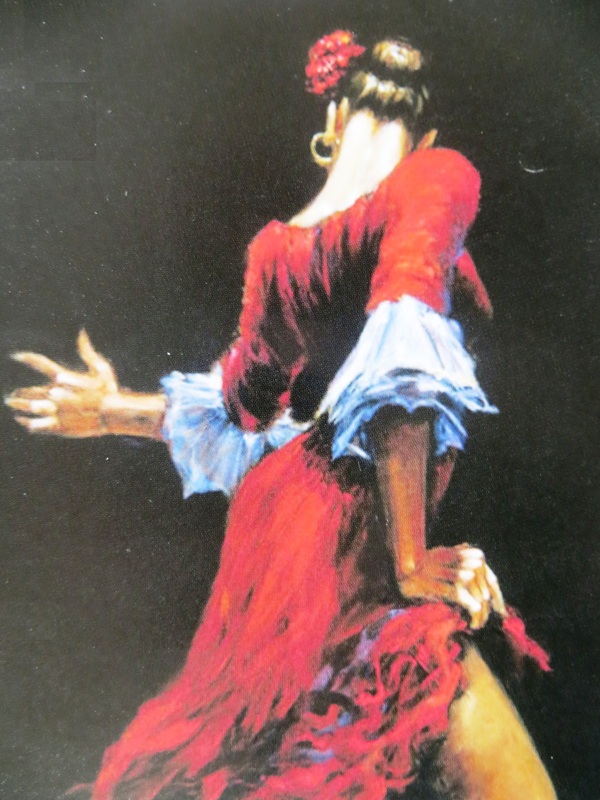 About half way along the route back to the hotel we heard the lyrical sound of Spanish guitars, clacking castanets, the rhythmic stamping of Cuban heels and clicking stilettos, rather like the sound of an approaching steam train and we wondered where it was coming from and then through the pavement level window of a cellar we could see a dancing class in full swing. 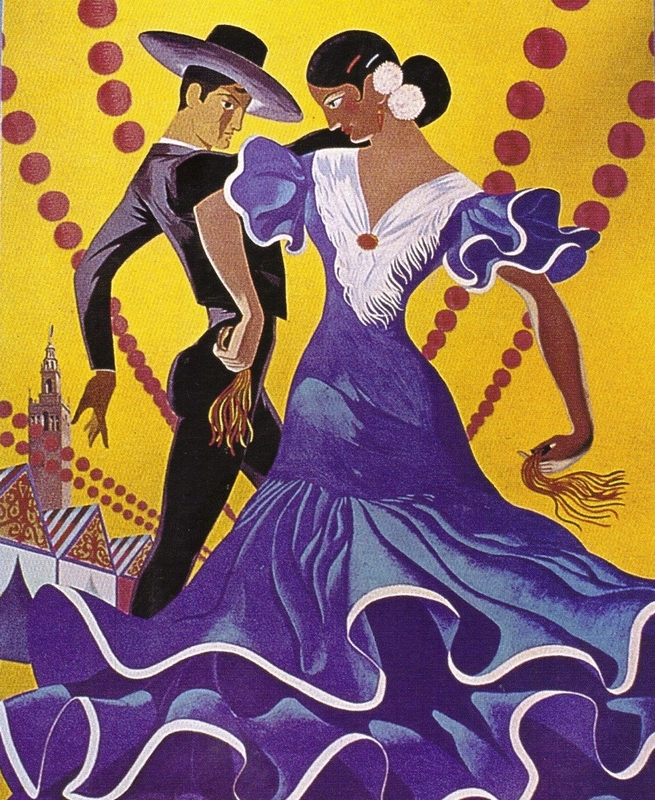 Some local people suggested that it would be quite all right to go inside and watch so we did just that and before the lesson ended we enjoyed fifteen minutes of genuine Spanish music played by an assembly of musicians and a group of young people dancing the flamenco; stamping, posturing and pouting in a rapid, aggressive, staccato style – wonderful vivacious movement, flicking to the left and prancing to the right and accompanied all the time by the sound of chattering music like a machine gun firing into the sky.